For breakfast I attempt the granola. I have managed to circumvent the normal menu and on request get, guess what, yoghurt to accompany it. Let’s just say that the granola was more like sugar puffs – an acquired taste that I have not yet acquired. We dock in Zeebrugge, yet another port associated with an appalling sea disaster, this time the Herald of Free Enterprise. Along with two of our dining companions, we join folk with yellow stickers in group 26 for a tour of ‘Scenic Flanders’. Clearly seat belt wearing is not an option on Flemish coaches and off we set on a grey Bruges day. For a while, Flanders is looking anything but scenic but our brilliant Flemish guide, incongruously called José, manages to make a virtue out of driving through a port. He tells us that Zeebrugge is the entrepot for the car industry. Over a million cars have already been transhipped from here this year. 6000-8000 cars are loaded onto each ship for onward transportation; these ships take 100 drivers four hours to empty. We drive through Ramskapelle (Church of the Ram), the site of a celebration yesterday commemorating a Flemish defeat over France in 1302. We also pass the C17th grain mill at Ramskapelle. Most of the buildings use very small bricks, similar to Elizabethan bricks in the UK. We see the poplar-lined canals known as ‘The Blinker’ and ‘The Stinker’; the latter is so named because it used to take the garbage out of Bruges. The landscape is predictably flat and there is wheat and sweet corn being grown for animal feed. The tops of several of the Medieval church towers were used as lighthouse beacons. 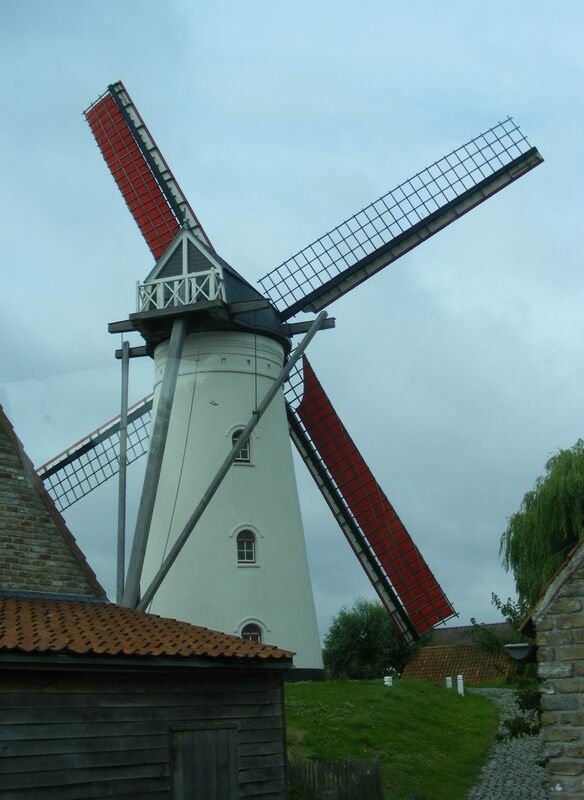 We alight to tour the Medieval city of Damme. The town hall, outside which some kind of horse drawn carriage rally is taking place, was built in 1388. In 1468, the Duke of Burgundy (Charles the Bold) married Margaret of York in Damme. We visit the site of the old herring market, where 33 million tons of Scandinavian salt herring was shipped in. I failed to grasp over what time period. On occasions, this saved the area from starvation, notably when the potato crops failed at the same time as the more well known Irish Famine. A dog appears on the flag of Damme as, allegedly, a dog was once used to plug a hole in a vital dam from which the town gets its name. Damme is the Hay-on-Wye of Belgium and there are many book stalls. We also view the ruined church at Damme, which was sacked and burnt by Protestants in 1582. In the grounds of the church is an impressive sculpture by Delporte. Next stop is Roose’s chocolate factory. The chocolate making demonstration is carried out by someone who is neither wearing gloves nor head covering. Maybe they don’t have food hygiene certificates in Flanders. We don’t buy any chocolate! We move on to the neo-gothic ‘Castle’ of Loppem or Lophem. This was designed by Pugin in 1856 for the Catholic Baron de van Calden. At this time, a member of the Braund family was working with Pugin and we wonder if he had any hand in the furniture design but we can find no proof. This is certainly neo-gothic in the extreme, with Catholic iconography overload, some very nice tiles and wooden carved banisters that took two men ten years to complete. A stuffed grizzly bear in the entrance hall was once an inhabitant of a local zoo. We learn that the treaty of Versailles was prepared here. On our return, we listened to a very amusing presentation by Chris Paton on his Scottish/Irish identity crisis, followed by Cyndi Ingle, of ‘Cyndi’s List’ fame. Then a quick change to try to appear ‘formal’ for dinner. Lacking a ‘cocktail dress’, I hide behind Chris and we are deemed acceptable. I have some very appetizing lamb chops and we repair upstairs for a talk by Carol Baxter, which engenders some heated and very interesting, debate about genealogy standards. 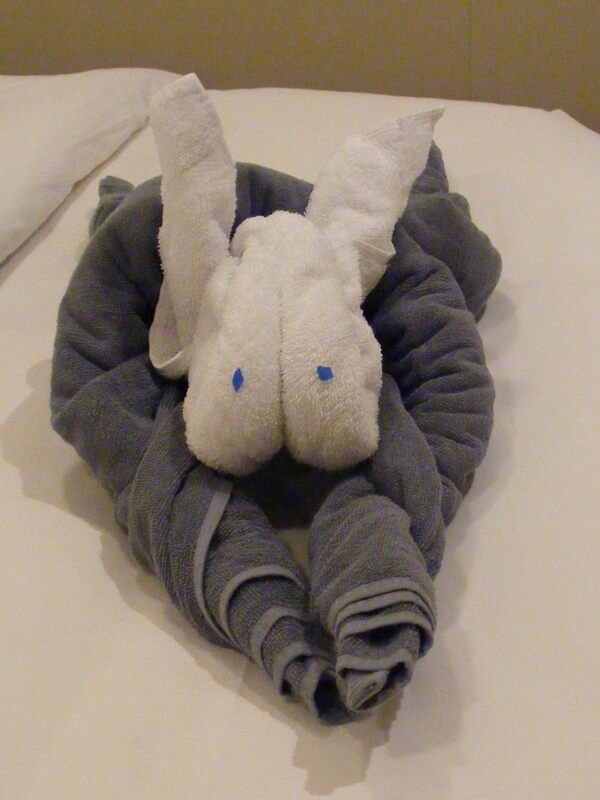 Jeffery, our stateroom attendant, has left chocolates on our pillows and an origami towel creation, which is very impressive. We chose our stateroom because it was on the end of a corridor in the bow (that’s the pointy end to you and me) and we would only have one neighbouring stateroom. Unfortunately, our one set of neighbours are the proverbial neighbours from hell. The first night was bad but last night they went in and out of their stateroom about twenty times between 1.00am and 5.30am. This was accompanied by jiggling of locks and slamming of doors. Add to this the loud music and chatter, together with periodic falling against the adjoining wall and no sleep was had by all. It even kept Chris awake, something that I thought was impossible. Mine could be the first after lunch presentation where the speaker falls asleep. I finally got to sleep at 5.45am, only to wake again briefly at 6.30am and eventually get up at 7.50am. Sadly, this meant missing the first session of the day and being semi-comatose for most of the rest of it. Very interesting session by Shauna Hicks on records of emigrants (or from her perspective immigrants) to Australia. Then I retired to try to get some sleep but I find sleeping in the day difficult, so I gave up the attempt. Back to the fray to listen to Jane Taubman on Family Historian and then after lunch it was my turn. A to Z of family history sources this time. I am competing with an art auction next door but despite mis-pronouncing Wagga Wagga (why it should be said Wogga Wogga I will never know), it seemed to be well received and there was a good crowd. Another session from Shauna Hicks, this time focussing on diaries and letters, excellent once again. Paul Milner’s informative presentation on the Parish Chest and time for our evening meal; Chris continued to work his way through his cow. After dinner today was Cyndi Ingle talking about her eponymous list, in a very entertaining vein. And so to bed and blessedly only twenty minutes of door slamming at 1.15am this time. Wagga Wagga is an Aboriginal word meaning place of many crows. I lived there in the early 1990’s & a branch of my family still does. You did very well despite your lack of sleep.